Sniper suit. Designed for laying down and Crawling. Light weight synthetic thread version. 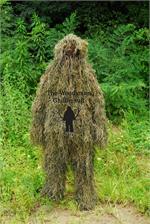 Bulls-Eye Ghillie Hood, Boonie Style with a mosquito mesh front, and chin strap. For those who only need the Torso covered. Fast Mobility Suit! Light weight Synthetic thread! 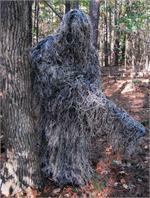 Paintball ghillie Suit - Full coverage - Head to toe! Sniper suit. Designed for laying down and Crawling. Jute thread version. For those who only need the Torso covered. Fast Mobility Suit! Jute thread version.